Whether it's because you've eaten too much stuffing, broccoli or gooey cheese, here are some top tips to help you control bloating this Christmas. This is a sponsored post, in partnership with our friends at Alflorex. I've worked with them to share with you some ways you can help control belly bloat and look after your gut in the lead up to and during the Christmas period. It's a part of Christmas that's as ingrained as hanging up a woolly stocking before bedtime, or putting up the tree. But that post-Christmas dinner bloat isn't really a great feeling. The great news though is that you can control it. 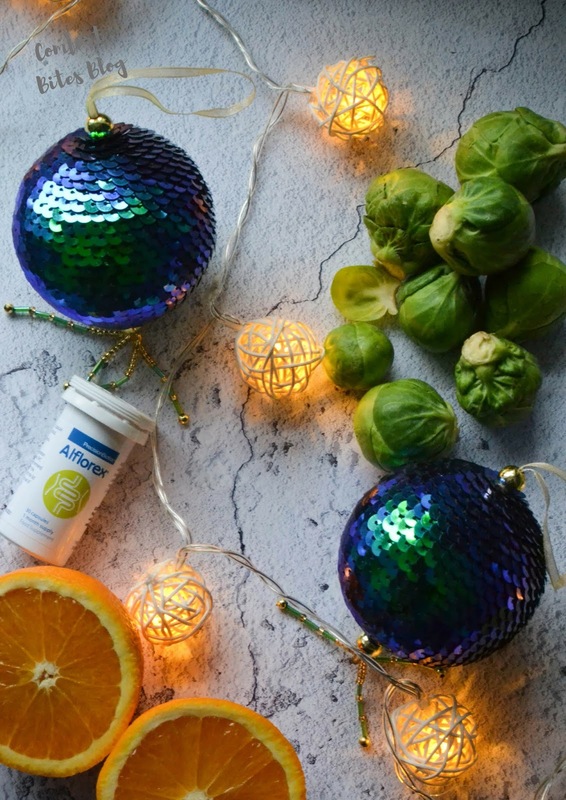 Here are some tips on how to manage festive bloating and look after your gut this winter. Food, especially the Christmas kind, is delicious. And there's so much around at this time of year that, along with dinner table conversation and Christmas cracker jokes you can feel like you're gulping down everything in sight. Slow down. Eating too quickly could mean that you're swallowing more air along with your food, and all that air has to collect somewhere. Help your digestion by eating slowly, chewing your food really well between bites and staying calm. The whole Christmas season can feel like a rush, but owe it to yourself to enjoy your meals more mindfully. If, like me, you do suffer with some IBS-type symptoms, it helps to keep an eye on which foods tend to make it worse. And it could be different foods for each of us. Broccoli, cabbage and stuffing are staples for the Christmas table but they might be causing your bloating. You might react to garlic, or carb-rich ingredients like potatoes or rice. Keep a food diary in the lead up to Christmas and jot down anything that seems to make bloating worse. It doesn't help I suppose that many people don't eat a lot of vegetables all year round and then eat 7 servings of them in one meal for their Christmas dinner! My personal triggers include broccoli, cabbage and rice - but I do find I can still enjoy smaller amounts of them with no effects. Champagne is such a treat at this time of year, but all those bubbles can get trapped in your digestive system. Same for lemonade or other fizzy drinks. Some people find that high sugar drinks like fruit juices can also exacerbate bloating, so go for low-sugar, non fizzy options or just order smaller-sized drinks and sip them slowly. You've got the tree up, presents to buy, the turkey to cook and the kids are arguing over the TV remote. Christmas isn't always the season of tranquility, and stress can lead to digestive problems and bloating. Science is establishing a growing link between our brain and gut and many people find that stress can make digestive problems worse. Find some time for yourself this Christmas, and just relax for a minute or two between tasks. Breathe deeply and remember - everything will sort itself out. I know, don't hate me. Christmas is the time of year where anything goes - I mean, most of us are tucking into chocolate liqueurs by 8am. But eating too much sugar can lead to bloating, and other digestive complaints like heartburn. It all comes down to sugar feeding the wrong type of bacteria - which can lead to an overgrowth of the more undesirable kind, giving you tummy upsets and gas pains. It's pretty hard to get through the whole festive season without sugar completely - so just reduce it and go for home made treats using natural, lower sugar ingredients. Your gut will thank you by the New Year. Start now, by eating a variety of fruits and vegetables to help support your gut health. Prebiotics are what our microbes feed on, and they love things like bananas, Jerusalem artichokes and chicory (if you're not used to eating a lot of veggies, go slowly to start with). Probiotics are the actual microbes themselves, and it's important for us to have a diverse population of gut flora to ensure good health. Our microbial community can be disrupted through many things, including diet, stress, lifestyle and antibiotic use - even the way you were born - so it's important to keep it topped up to ensure you have a thriving community of bacteria working for you. I really like the sound of Alflorex - I have a packet to try, which I'll start taking next week. It contains a unique 35624® live culture, which is a naturally occurring 'good' bacteria, a member of the family of microbes passed on by mother to baby at birth. It's also suitable if you're on a Low FODMAP diet and is free of dairy, gluten, soya, lactose and is suitable for vegetarians (it does contain corn starch though so it's not for you if you're strict paleo). I love that it's FODMAP friendly, and has been scientifically studied and found to bring a reduction of symptoms in two separate trials. Sounds promising! Priming our guts before the inevitable onslaught of sprouts, champagne and breakfast chocolates sounds like a plan, and TV doctor Pixie McKenna is a fan. She says, "Our life is getting busier, faster, we're eating on the hoof, we're desk dining, we're drinking too much; there's a whole host of things. Some of this is very much in our control in terms of looking at out own lifestyle and we need to improve on that so until we do I think digestive disorders are going to be very much in the forefront... There are lots of products out there that calm the gut and that's very exciting, but what's so great now is we have a product like Alflorex, where we know that there's robust evidence behind it... I definitely recommend Alflorex if you're suffering from any gut health issues - the clinical evidence speaks for itself." 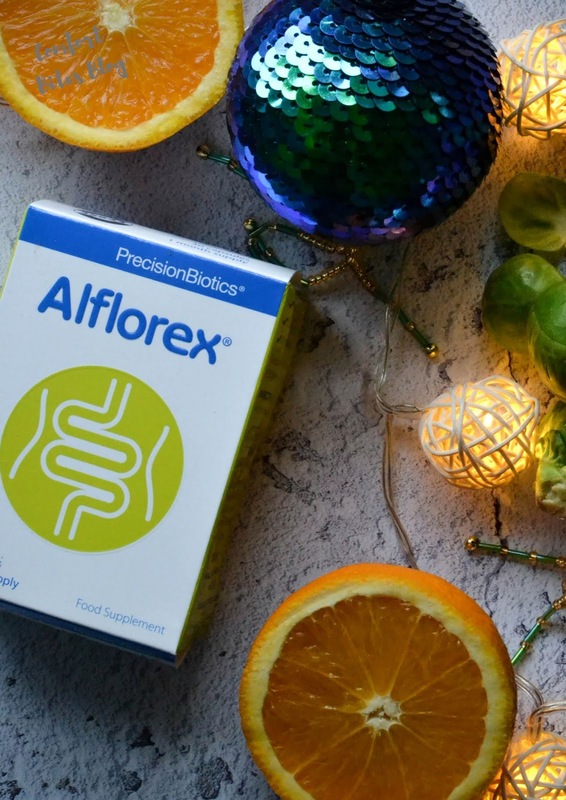 Alflorex recommends that, because it can take a while to build up the right balance of bacteria, to start taking it around 4 weeks before Christmas. If you have any questions about Alflorex or if you're not sure if it's right for you, visit the website below or have a chat with your doctor. Find out more on the Alflorex website - there's a FAQ section there that will help answer your questions - and it's also available on Amazon, too. Go along and read the reviews there. I hope it helps! Tried Alflorex? Let me know what you think in the comments below. I have suffered with IBS for years, during this time I have used all the usual products to help when I have a flare up. However, I started using Alflorex after being told about it from my dietitian. They explained how it worked differently to treatment products and that it has been clinically shown to reduce symptoms. I have been taking one a day for 3 months and it really has reduced my bloating and urgent need to find a toilet or at least know where one is!Really pleased that I tried them.